From 5th to 8th March 2016 we will be exhibiting our products in ProLight+Sound show in Frankfurt, as we have been doing during last 18 years! 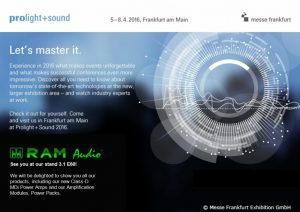 All our four series of Power Amplifiers, S, V, Zetta and new MDi Series, will be displayed in our stand. Also our new line of Amplifier Modules to self-power powerful acoustics cabinets, Power Pack Series, will be showed. It would be our pleasure to meet you there to show our products, discuss about a collaboration between our companies or clear up possible doubts you could have regarding our amps, applications, purchase conditions, etc. If you want to schedule an appointment with our sales people attending the show, please do not hesitate to send us an e-mail asking for it. We will wait for you at Hall 3.1 – stand E60. See you in Frankfurt!